Are you ready for December full of events and great occasions to get some awesome gifts? We ho ho hope you are! We started this special month with "The Silver Day" and it's just beginning of exciting event series we prepared for you. Puzzles, riddles, challenges and much more awaits you! You will be informed about each event here on the forum and also in game, so have your eyes wide open and enjoy this festive month. For each event you will be able to get Christmas Points and at the end of the month you will be able to trade those point for awesome items! So remember to check forum/FB/game every day to not miss anything! Ho ho hooooo let's begin this crazy Christmas month! We just received first task for you all from Santa Dema. It's not too hard for it's also not easy! I will require from you checking some places in order to solve our Christmas Riddle. We are sure that you guess our small riddle super fast! And when you will... send PM on the forum to CM Lilpwnd or Mod Leonidas ! Include correct answer, server you playing on and your nickname in game! Correct answer will be awarded 2 Christmas Points! And they are worth gathering because at the end of the month you will be able to trade them for awesome items! Next Christmas event is here! With a blast! An avalanche of snow has tumbled down the mountain and a bunch of creatures were caught in the snowfall! Help us identify the cards! Below you can see trapped creatures! Help us to save them by identifying them. You all are real Heroes so we are sure you will be able to help them! They also need to be on time for Christmas celebration. Send PM on the forum to CM Lilpwnd ! Include correct answer (Card name and Rank), server you playing on and your nickname in game! Correct answer will be awarded 1 Christmas Point per correctly guessed card! Please remember that multiple ranks were allowed. Sending changes after event ended is not allowed. Time to break some codes like true Santa Dema Christmas Agents! 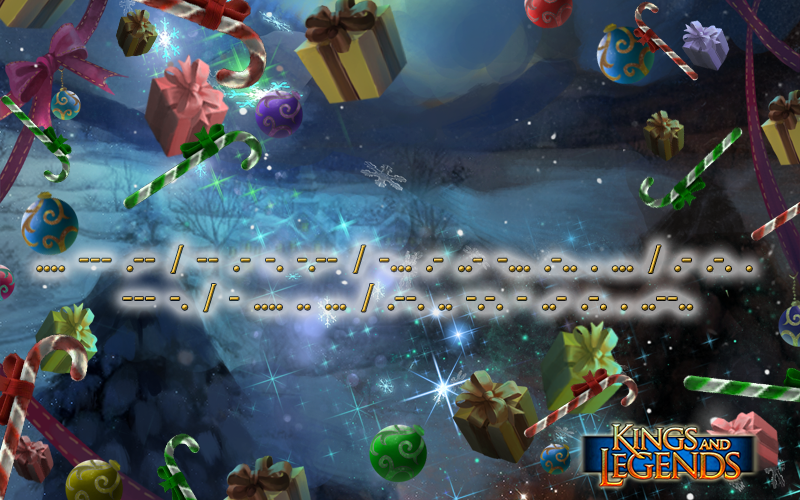 If you want to save KaL Christmas you need to break this code as fast as you can! Clock is ticking! You need to send correct answer of the question before 09.12 00:00! Don't be late! Below you can find picture with the code, take it and break it! Send PM with correct answer to Mod Stratios or Mod Leonidas on our forum! Correct answer will be awarded 3 Christmas Points! Ho ho hoooo~! Today we will BREAK YOUR EYES and challenge you with a tricky picture. 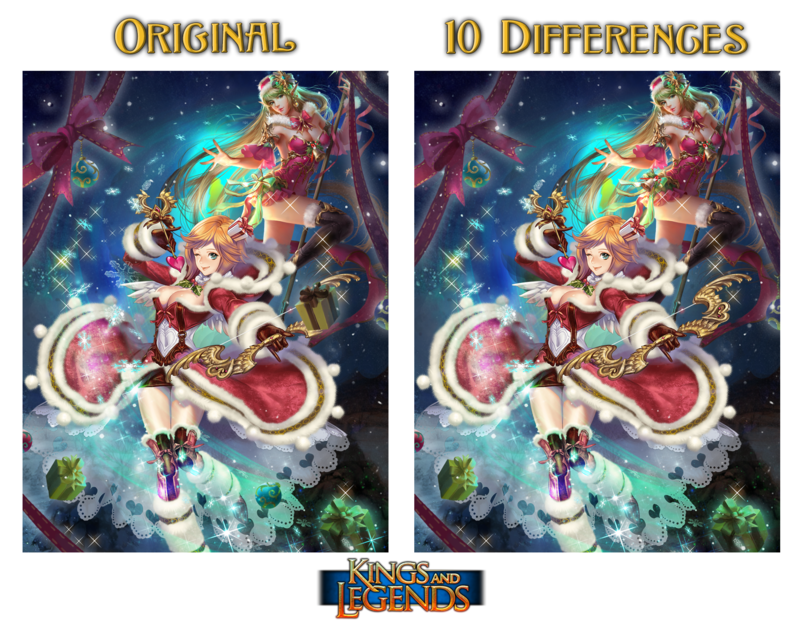 Rules are simple: Spot the 10 differences in the right-image and send us a picture where you've marked them all clearly. Due to limitation of picture size you can send via PM - PLEASE USE IMAGE HOSTING and share link with Mods. Correct answer will be awarded 1 Christmas Points per correctly marked mistake = 10 points to win! Be patient because some curious creatures will get in your way. So defeat the goblins, ogres and other creatures to get your stuff for Christmas. Don't let them stop you! Your goal is to defeat Bosses in our game! You will get get 1 Point for defeating 1 Boss. You can get maximum of 10 Points(10 Bossfights). Clock is ticking! You need to get your Christmas gifts before 14.12 10:00AM! We can let it snow but we also need to take care of our City! Especially City Battlements because the enemies are not sleeping like bears during the winter. So let's defeat some in battlements! Defeat the City Battlements and for each won Battlement get 2 Christmas Points! Maximum amount of Battlements is 5, so you can get maximum 10 points from this snowy event. You have time to do it from today 11:00 (server time) until tomorrow 10:00! Get ready! The elves sort the wish lists to meet everyone's wishes as much as possible. But an elf just does not go any further. The letters of the wishes are totally mixed. Help the elf find out the wishes by matching the letters correctly. For every correct word you get 1 point ! All correct words will give you 8 points! It's time to show your enemies who is true Snowball master! Fight them, win and get Christmas Points. Fight enemies 1vs1/2vs2/4vs4 at the Arena. For Each fight you will get 1 Christmas Point - for each fight you will win, you will get 2 Christmas Points! You have time to do it from today 20.12.2016 12:00 (server time) until tomorrow 21.12.2016 10:00! Get ready! It's time to break the Christmas code again! Looks like Santa is trying to tell us something but it is so cold that he is talking in some weird way! Jump to the game, find code, decode it and find the answer! Code will be displayed in game (on public chat) between 10:40 and 23:59 today! Clock is ticking! You need to send correct answer before today 23:59! And again Santa needs your help. He wrote letter to all of us but some nasty creature ripped this message into pieces! So now he asking you to help him. Solve the puzzles and find correct answer. Correct answer will award you 4 Christmas Points! Christmas is over but Christmas Trees are still around! How about climbing them? Sound silly but it can actually give you some Christmas Points. You have time to do it from today 27.12.2016 11:00 (server time) until 02.01.2017 10:00! Get ready! Christmas Tree event got extended - until 02.01.2017 10:00! Get ready! Today is the day! Christmas Shop is finally here! Below you can see full list of items you can get for each amount of points. At the end of this week, on 6.1 we will post in this topic info on what amount of points you each of you gathered. And starting from Friday you will have full week to make decision on what you want to receive. Please don't sent your wishes now. Hold your horses until list of players will be posted and all info (where to send wishes and how) will be given. We will avoid mess in our PM boxes! Some points levels require choice on the reward! So now it's time to see how many points each of you received! We have couple important information about it. We are aware that some of you might not agree with what you will see (mistakes with counting can happen). Events which ones happened in the game are 100% calculated correctly. Only points any of you might be missing are from events when you needed to sent us PM. Some of you made mistakes in their own nicknames or even gave incorrect nicknames. This totally could happen. How to give us info that there is a mistake in points? Simply write to any MOD or CM and we will try to verify this problem! After this we will gather whole data and rewards will be sent out following week - no fixed date, so be patient. This is super important to avoid mess. Please stick to it or you will make our work even longer. If you will miss any of this information stuff, your message will be ignored. Those mistakes are constantly made during events and it's giving us extra time to wait for your reply and extra time to provide you rewards. Rewards might arrive with a delay. Also please remember that your mailbox might be full, so delete mails you don't need anymore to make space for rewards. INCLUDE YOUR INGAME NICKNAME AND SERVER YOU PLAYING ON. Thank you for patience and we hope you all enjoyed the event!